jars of pickling vegetables in my fridge. label it as trite or kitsch or old-fashioned. harried pace of work and, sometimes, life. wheat germ, salt, and cinnamon. – In a small saucepan, mix the honey and brown sugar. stir in the peanut butter and vanilla until smooth. mixture. Add the oil, and stir thoroughly until everything is evenly coated. The mixture will be chunky and rough. (I like stirring every 10 minutes). this one lined with parchment, and spread out. dates are the perfect dried fruit for it. labels and share with family and friends! luxuriously slow as our week was dizzyingly fast! I completely and heartily agree about how comforting and calming cooking can be. You are forced to slow down, take one step at a time and be patient while you wait for egg whites to stiffen or chocolate to melt. Plus there's that feeling you get when things turn out perfect and delicious. Admittedly, my finished products are not as good for me and my body because they almost always involve sugar, chocolate and cream cheese. But at least the emotional benefits of making (and eating!) them are still there. Hehe. The granola looks super and anything homemade is tops in my book. Great post, but when you start making your own detergent and conditioner, you've just gone too far! This looks like a delightful way to start the day! So delish! Thanks for sharing, Joey! Hi Midge! Homemade + peanut butter = can't be beat! So true…the perfect stress buster, and with delicious goodies at the end of it all to boot! There's nothing wrong with homemade anything and you're so right too that it slows us down and relieves some of the stress of that busy life we all seem to have these days. Love the granola! It´s retro cool to make your own things! 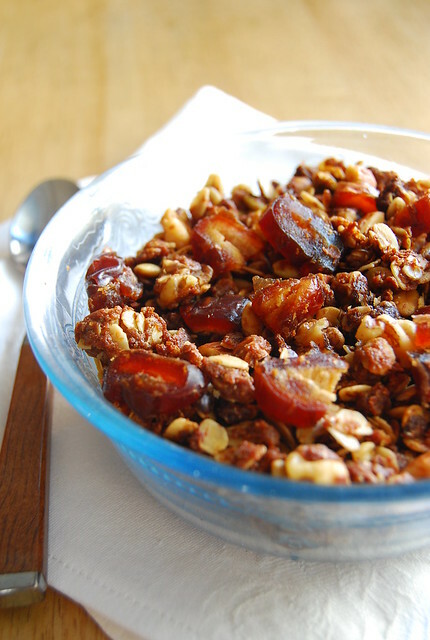 This granola is amazing and the only way to have is to make it yourself! i've always wanted to make granola and after reading this, i finally got around to doing it. i used heidi swanson's recipe though (grainola), which is so good that minutes after the pans went out of the oven, my partner started snacking on them! Great! Thanks for the tip. Just bad timing as I can't eat anything scratchy because of this wretched condition. But I will get old fashioned oats soon 🙂 excited! Great recipe. I used Aseda Raw Honey. It really gave everything an all natural taste. I went back to the store to get more but they were sold out, so I looked them up online. Here's a link to their kickstarter account. Try it! You'll never settle for anything else. Where do you buy your wheat germ here? Been looking for that stuff everywhere!